Hey look! I finished a holiday project before the actual holiday! I used Jaybird's hexagons, block three, and her second layout. Mine are 6" unfinished, which comes to about 30" on each side and about 50x60" across the widest points. But my favorite part is definitely the quilting! I did a spiderweb in glow-in-the-dark thread. I had trouble picking a backing - I tried a glow-in-the-dark fabric but didn't have enough. Then I tried minkee but the stitches disappeared in the pile, which defeated the purpose. I ended up using plain Kona black, and it stands out so well. 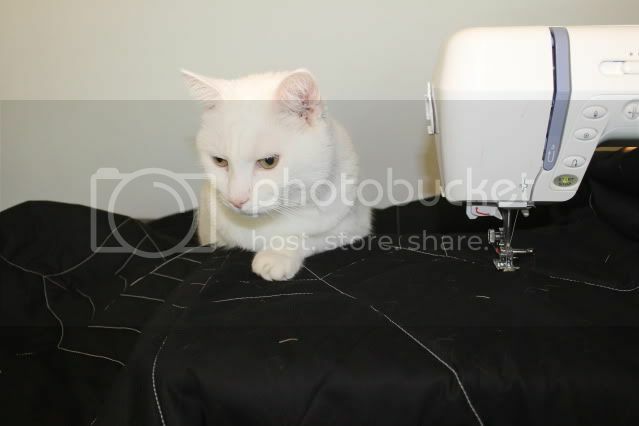 I had help with the quilting. My black Halloween cat wouldn't get near it, of course. Those things never act like a prop when I need one. All propped-out in my front garden. None of that was purchased for this photo shoot - I like to make my front garden into an abandoned graveyard so I don't have to weed for Halloween. The yellow is The Name Game by Quilt Country (Moda) - leftover from the borders of the Steelers. The Halloween fabric is mostly Haunted House by Alexander Henry or Spooktacular by Sanae (Moda.) All but two of the fat quarters came from my stash. Interesting tidbit - the batting is black. And it does make a difference with the black backing and several of the fabrics - the gold is darker than it is in the Steelers quilt. How fun! 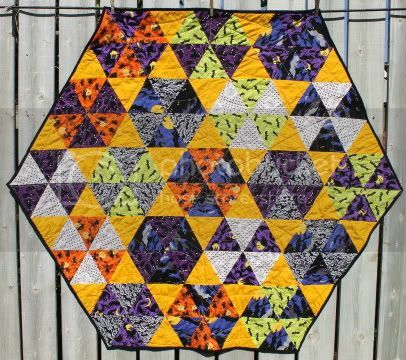 Love the spiderweb quilting! Very cute. Congrats on getting it done before Halloween! Very nice work thanks for the quilt for division. great work! 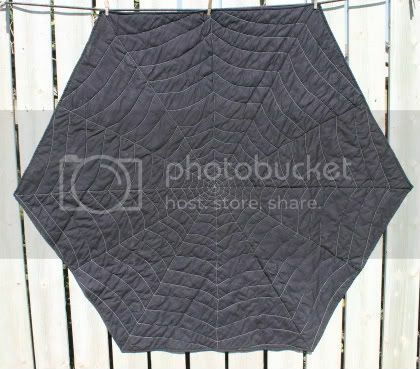 Love the quilting, but I gotta ask... does it pucker a bit in the middle because the quilting is more dense there? That always makes me hesitate to quilt that many intersecting lines as I have had that experience before. Fab finish and in before the DEADline! REALLY like this! Very original. Very unusual & fun - good going! I love it, especially the quilting! 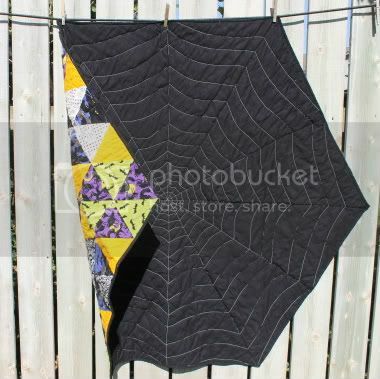 That spider web quilting is fabulous! I love it! Oooo! 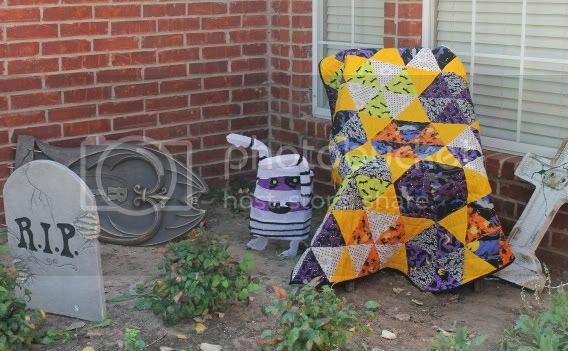 I love the quilting and the Halloween theme! It's wonderful! Oh wow, I love this! Great job!